This is so super duper belated but the link to our (Lina and I) Webquest can be found at the right hand side of this page. It's under the "Links" section. I didn't realize that it was not immediately obvious. My apologies! Thanks Sunarti for the feedback! 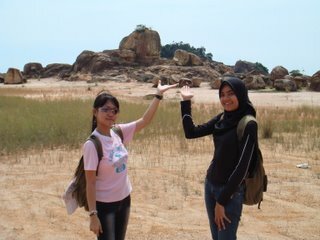 The Karimun trip which we had last Saturday was indeed an apt way to round up the module to a close. It came a day after we submitted all our assignments for the semester and also, for the QCG521 module. Needless to say, Friday saw me eagerly anticipating the trip. This anticipation stemmed not only from the fact that I was looking forward to wind down but also, because I've never been to Karimun before. Is it going to be something like Batam? Or is it some deserted island? What would it look like? These were the questions that plagued me. Well, my questions were answered soon enough. Karimun turned out to be a pretty undeveloped island. 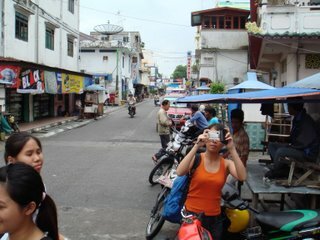 As our guide, Peter, describes it, Karimun is how Singapore was like 30-40 years ago. In a way, this is good because I have the opportunity to see and take lots of pictures of a developing area. On the other hand, it has been such a long time since I last went to such places that I can't help but got a bit of a culture shock when I got there. Therefore, for the first hour or so that I was there, I can't help cringing inwardly at almost everything I encountered. I found the place too crowded, the streets too dirty, the buildings too decrepit, the food too unappetizing... and the list goes on. 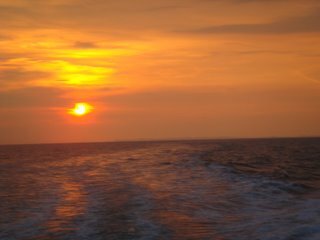 However, it was only after we really got down to travelling around the island that I began to get more comfortable with the island and appreciate its differences. Anyway, I shan't type a long drawn out entry here. Let the photos do the talking. The first order of the day: Breakfast! 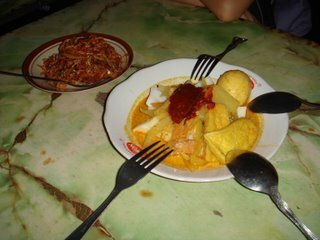 The said breakfast: Karimun-style lontong. Unlike the lontong dish you see in Singapore, the dish there comes with fried hard boiled egg, potato and a generous helping of fried anchovies. 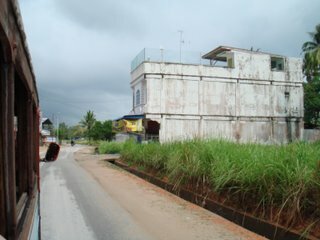 A view of the streets of one of the towns of Karimun. 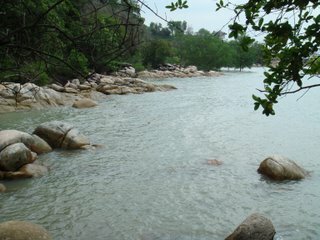 This was just a short distance from the ferry terminal, Tanjung Balai. Our trusted bus. 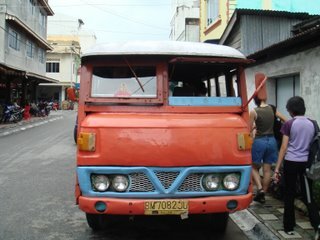 According our guide, this bus is distinct only to Karimun island. The whole lot of us aboard the bus. Just look at their beaming faces! Again, this was taken aboard the bus. Heading towards the outskirts of town. 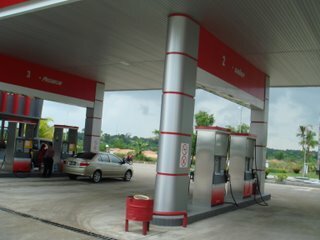 The one and only petrol station found on Karimun which is located slightly outside its town. Apparently prior to this, the islanders receive their supply of petrol from shops. The petrol are filled inside 1-litre bottles costing about 5500 rupiah each. Actually, these shops are still the main supplier of petrol there despite the recent construction of the petrol station. 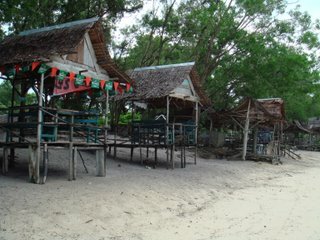 Our first stop was Pelawan Beach. This beach has been proposed and designated as a tourist site. The huts that you see above were built as part of this initiative. However, it's built at approximately 3-5 metres away from the water's edge! The issue of the feasibility of such construction has been highlighted by Mr Yee as a possible angle we can get students to ponder and work on. My attempt to capture a snapshot of the bays and headlands found along Pelawan Beach. Not very successful though. 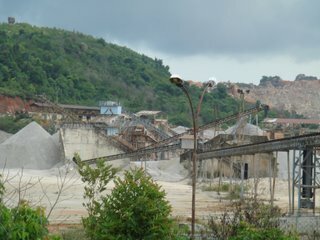 This granite quarry belongs to Sembawang Corporation. That's right people. THE Sembawang Corporation found in Singapore. This is where we get the materials for land reclamation from. Forging up the steep incline to our next stop: Tors! This was one of the highlights of the whole trip. 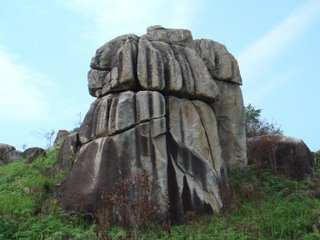 One of the first few who has successfully scaled up one of the huge rock outcrops found at the abovementioned site. The one which caught our breaths and left us fascinated. Nature's beauty, God's miracle. Ladies and gentlemen, welcome to the semi-arid environment. 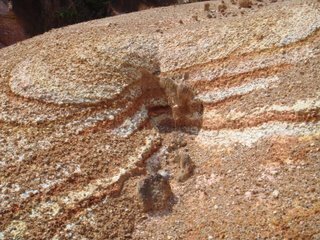 Live: Spheroidal weathering. Finally, we got to see the process we've been learning for the past few years. 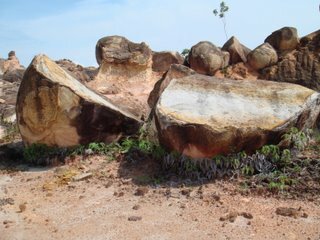 These two boulders were once part of a whole. Ahhh... Sustenance! This was the lin-ner (lunch+dinner) which we had prior to boarding the ferry back to Singapore. Time for a wacky shot before we leave for Singapore! 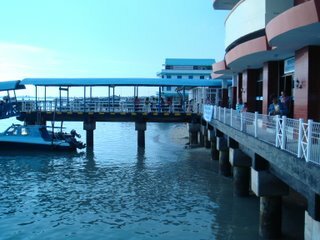 The jetty: One last snapshot of Karimun. In case you're wondering why the picture is all blue.. No, the place didn't turn eerily blue all of a sudden. I was actually trying out the 'soft snap' function in my camera. The sunset. A fitting end to the trip. Back in Singapore. We're sunburnt and tanned but we're definitely satisfied. Our WebQuest started with the conceptualization phase where we turned to the current upper secondary textbooks for ideas on what to focus on for it. As we looked through the textbooks, we were hooked on the idea of creating a WebQuest for one of the case studies found there. Though the case study could evidently be found in the textbook, we wanted the kids to glean the information on their own instead of waiting for us to spoonfeed them with it. We wanted them to have the opportunity to look through the available content on the web and have a hand at researching. Having found a focus on why we wanted the students to use the WebQuest, our main problem now lies in the fact that we lacked the syllabus focus. We had to ensure that the WebQuest was relevant to the syllabus. This focus turned out to be that students are supposed to be aware of the advantages and disadvantages of development. With these issues settled, we now had to think of a suitable case study for the students to work on. Obviously, we couldn't be doing the exact same case study found in the textbook as students could easily read off from it. This would defeat the whole purpose of ensuring that students have a hand at research. After thinking further, we decided to settle on the Three Gorges Dam as our case study. The main reason why the dam was chosen as a case study was because an abundance of information could be found regarding it. Not only that, there were lots of information pertaining to the content that we wanted to focus on. That is, the advantages and disadvantages of development. Hence, we found the Three Gorges Dam to be an apt case study for the students to work on. With everything in place, we're now left with transferring all our ideas onto the website. We had chosen to use Microsoft Expression to create our WebQuest but little did we know that we had made a wrong move in chosing this platform. While the initial stages was a breeze due to the user-friendly interface that the program has, the problems arose when we uploaded our files onto Geocities. All our layout appeared haphazardly. They were out of place and the colours weren't as we intended it to be. Thinking that the issue lies in the CSS codes, we thus tried to edit that. However, the more we edited, the worst it got! Therefore, imagine the look of disbelief and later, horror when we realized at 1130hrs on the project submission day itself that we might be facing the prospects of re-doing our site. Actually, that was what happened. We ended up having to cut and paste all our content from our Geocities site to the current one (hosted on WebQuest Portal). This took approximately 30-40 minutes. With that done, we then looked through our site. Being able to view the WebQuest like that in itself brought a number of realizations to us. Firstly, we realized that the students might not get the full idea of what they were supposed to get out of the task given to them. While the task was to essentially find out the advantages and disadvantages of the construction of the Three Gorges Dam, this was actually only a platform that serves to highlight to them a larger issue at hand: that not all development is good. We hoped that the students were able to realize this reality attached to development as they find out the advantages and disadvantages of the construction of the dam. However, the nature of the task assigned to them might not instantly and explicitly bring out this awareness to the students. Therefore, we had to add an extra paragraph in the Introduction page to inform them that this was what they were supposed to gather at the end of their WebQuest journey. We also re-iterated this message in the Conclusion page to ensure that students are aware of this issue. With this problem rectified, we went to on handle another problem that we feel was inherent in our WebQuest. That is, its ability to capture the students' interest. We tried to think of possible scenarios that we can use in our Introduction page. However, I think that both of us lacked sleep (slept for only one to two hours the night before) and were too tired by then to feel at all inspired. We thus decided to improve on the current introduction that we had instead of having an entirely new one. This improvement took the form of adding a video footage of the Yangtze River and the Three Gorges Dam. Lastly, we were concerned over the issue of scaffolding. We were worried that there was insufficient scaffolding given to the students. Overcoming this issue entailed bringing ourselves down to their level. We had to read the scaffolding found on the Process page through their eyes. This was a rather challenging task as we had to try to pretend we're seeing the WebQuest for the first time and that we do not know anything about the case study being presented. Upon hindsight, I realized that we should have asked someone else to read our WebQuest instead of doing it ourselves. That would have been a much better option when it comes to testing out whether enough scaffolding was given. In fact, it would have been better if we had asked someone else to go through the WebQuest and gather their inputs on the interest and value levels that they perceive can be gathered from our WebQuest. That said, I feel that the whole process of creating this WebQuest has provided me with a valuable learning experience. Through this process, I was again brought to the awareness that students matter. Students, students, students. This was the running theme throughout the creation of this WebQuest from its conceptualization to its delivery phase. Questions of "Why do I want my students to use this WebQuest? ", "Why would the WebQuest be relevant to them? ", "Can they do this? ", "Would they find the instructions too confusing? ", "Would I be able to capture their interest? ", "Would they get the content I'm trying to bring across?" among others constantly inundate my mind throughout the process. At the end of it all, something which I thought was an easy task to carry out turned out to be quite difficult. It was difficult not only because of the considerations pertaining to students which I had to grapple with but also, due to the technical glitches I encountered along the way. Despite all these, I think that I will adopt WebQuest for one of my lessons in future. Creating it has made me realize the value behind WebQuests which I was not aware of previously. Admittedly, I was not bought over by the idea of WebQuests when it was first introduced by Prof Chang earlier on in the semester. This view was further enhanced as I read up more on WebQuests over the net. I had felt that the word 'WebQuest' was merely a substitute for ICT-based lessons. Well, I was proven wrong. I now advocate the use of WebQuests in the classroom BUT there is one thing that I have reservations over. Are we just going to get the students to complete the tasks found in the WebQuests or are we going to include the grades they receive on those tasks into their CAs? Afterall, the students did put in some effort in completing the tasks and I feel that this should be recognized. Also, what of students who deem the tasks they had to do for WebQuests as a waste of time? These students might not find the value in completing the WebQuests and as a result, might not benefit from it. As evident by now, the final field studies package that my group submitted was vastly different from the initial one which we had planned. 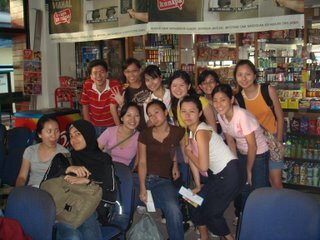 We had initially planned the fieldtrip to be conducted at Pulau Ubin but it ended up being carried out at Chinatown instead. The main reason why such a major shift in site (from an undeveloped to a highly developed and urbanised area) occurred was due to the unfeasibility of conducting a field trip there. We totally didn't expect the place to be huge! The size that I estimated and envisioned the place to be based on the scale given on the map was nowhere as huge as the real place. Therein lies a two very important learning lessons for us as teachers when it comes to conducting a fieldtrip: importance of a recce and not to overly rely on maps. Come to think of it, these two points are inter-related. Therefore, maybe a better way of phrasing this lesson learnt could be "don't rely too much on maps as it is only through a recce that one gets to have a clearer idea of the place". In conceptualizing the activities for our fieldwork package, we had consulted and relied heavily on the Pulau Ubin map. In fact, going by the way we planned and decided things, it has seemed as though the map was a 3D representation of Pulau Ubin or something. It was only after we arrived at the place for our recce that we slowly began to get the full sense of it. Admittedly, the recce left us feeling pretty lost (not literally though). All our initial plans seemed unfeasible. We tried to think of other activities we can have on Pulau Ubin for our field studies package and discussed it with both Mr Yee and Kenneth. Our consultation with them led us to the decision to scrap the Pulau Ubin idea and work on Chinatown instead. Chinatown was a good alternative choice for us since we had already done a mini field studies assignment on it for Mr Yee's lesson. All that was needed was for us to widen the scope that we had worked on previously and transform it into a full field studies package involving a pre-fieldtrip, during fieldtrip and post-fieldtrip activities. With that conceptualization phase over, we finally moved on to getting our field studies package down in black and white. This in itself was a process that was stress inducing. It was stressful not because we did not have the content to work on. We did. Rather, it was due to the glitches we encountered while we're organizing and editing our package in Microsoft Word. We had to cut, paste and move around the content so that it flows. After that, we had to do lots of editing. We had to make sure there were no grammatical errors in our project, that there was clarity in what we wrote, that all the necessary content needed was there, that the references were properly cited, that the page numbers flowed with the contents page and that there were no hiccups in the format (font, font size, spacing, paragraphing etc) used. With such a sheer amount of work to be done in editing, I was definitely glad that my team had enough manpower to divide the editing job. I was even more glad when we headed to the printer's to get our package printed out. I really thought our work would end within 5 minutes. But NO!! It went to stretch on for another two to three hours at least. The supposed-last-look-through-the-project before sending it to the printer's uncovered other areas we missed which needed to be edited. With a groan, we set out to correct the mistakes. When we finally went to print it some two hours later and were collating the pages, we discovered yet MORE errors. This time, it had to do with the page numbering. They did not correspond to the page numbers stated on the content page AND we even missed out one or two more pages which should have been stated in the content page. Therefore, imagine the look of dismay (not to mention how our stress-ometer suddenly rocketed sky high) when we realized that we needed to do MORE editing and re-print some pages. Thus, we had to go back to our document and edit the things inside. Thank goodness that was the last of the edits that we had to do as after that was done, we were (finally!) able to submit our field studies package. As I pondered over what I just went through later that night, I began (it's so belated!) 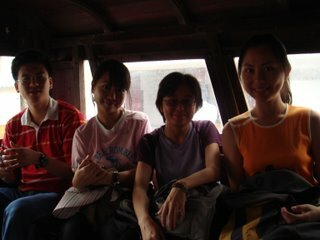 to fully appreciate the fieldtrip (or what little of it) which I went on as a student. 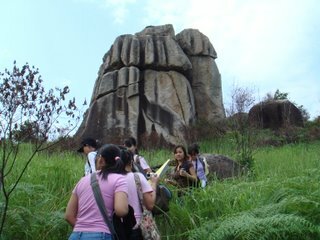 I had never envisioned that a lot of thought and consideration went into the fieldtrips that I went on previously. It's only after I worked on this field studies package that the enormity of the effort put in finally dawned on me. The conceptualization phase, the recce, the tying up of lose ends etc...that was a whole LOT of work involved there! The sheer amount of work is compunded by the fact that there were several issues pertaining to students' safety that needed to be considered. 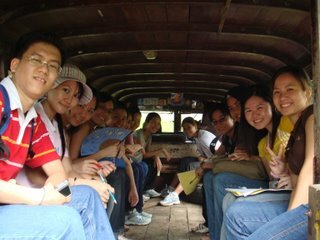 Though the pedagogical content would be important throughout the fieldtrip, teachers should also keep in mind issues of safety as well. This brings me to another point. By now, I've already accepted the fact that I'm in a career that requires me to be thoughtful of my charges (the students!). Who says that a teacher only teaches ought to be shot. In instances like that of a fieldtrip, it is evident that the definition of a teacher encapsulates more than just teaching. Here, you're also their 'bodyguard'. You need to keep your eyes opened and ensure that at all times, nothing bad would befall them. This is a pretty daunting task considering that you're guarding (not to mention teaching and guiding) a group of students in an open environment. Despite that, the value of fieldtrips should override the difficulties in conceptualizing it. Based on my past experiences, field trips have the ability of not only making the subject, topic and lesson more interesting but also, to induce interest in it. I also find that the relevance of what I have studied in textbook is only made explicit to me after I have seen and experienced it in real life. Another important thing to note about field trips is that it concretises our learning. Seeing something in real life makes it much more easier for us to remember. Before I end this entry, I'd just like to introduce a site which provides an alternative to field trips. If you find planning and implementing field trips pretty daunting or, if you're too busy to conduct them, an alternative would be this. This site lists only some examples of virtual fieldtrips therefore, you can probably Google for more of such resources on the net if you find it inappropriate for your lesson. Frankly, I don't really find them all that useful as it seemed as though I'm reading just another textbook detailing a case study of that particular area. 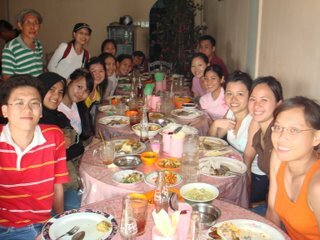 Then again I belong to the camp who subscribes to the notion that nothing beats bringing students out on field trips. Nuff' said. The following is part two of my post-microteaching reflection. It is definitely long overdue. Therefore, I had kind of forgotten half of the things I'd initially planned to write and this has in turn made me so regretful that I'd written it so late! However, I do hope that there are some learning points to be gathered from (what little of) it. 1. It's people I'm dealing with here! As I reflected upon my microteaching, my mind couldn't help but recall the part whereby I'd planned to handle Yunbing's self-mutilation after I've given the class an activity to do. However, I never got around to do it as the events that unfolded later had clearly illustrated. I'd foolishly presumed that things would go according to plan. Well, earth-check to Falilah! This is not a static environment you're in here! I'd forgotten one of the most important aspects of teaching: that the classroom is a highly dynamic environment. This dynamism is spurred by the fact that the active agents presiding in it are people. One with thoughts and emotions. One having an own will to decide what she/he wants and don't want to do. One with the power to act and react to circumstances. With these factors coming into play, it was definitely complacent of me to assume for even a second that things would go according to plan. In choosing to delay dealing with Yunbing's problem, I'd also overlooked the fact that my delay would not automatically translate into a delay in my students' reaction to the problem. Therefore, a take home point for me (and I hope all of you as well) is to always remember that we're dealing with people. People = dynamism. Hence, don't assume too much! Do take into account your students' thoughts and reactions to situations. Importantly, do keep in mind that change is the order in the classroom. I'd expected the situation to remain unchanging till the time I was ready to deal with it. Well, such a fallacy that was. 2. Who says that ignorance is bliss? I realized that I'd committed a grave error earlier on in my microteaching. I'd chosen to ignore tell-tale signs of Yunbing's problem. In fact, my ignorance didn't just end there. I didn't fully follow up with the incident where Melissa and Yingchian were hiding in the closet. Instead, I'd just briefly questioned them about it and later, tried to continue on with my lesson. No probing whatsoever as to the reason why they were there. Later, when Kaixing came back to the class, I only questioned him and stopped at that. Again, I went on to continue with my lesson. I find that this choice to ignore what just happened regardless of the reasons why I did that is highly inappropriate on my part. What if the student felt slighted by my ignorance? What if something bad happened to them due to this exact same ignorance? Heck, what if I were to get into trouble due to my ignorance? When I pondered upon this issue further, I came to the conclusion that I do not want to be in a position whereby something detrimental would befall me or my students as a result of my own ignorance. True, I might be saving myself a lot of headache by choosing to ignore certain issues and problems as it was presented. However, in the long run, I can't just ignore whatever comes my way just because I deem it to be more convenient to do so. Certain things do require one to be more insistent and probe why it is so in order for one to get to the underlying root of the problem. It had seemed to me that I was really showing my fury at my students and was firm with them during microteaching. However, watching the vcd has brought me to the realization that it apparently wasn't so. In fact, I'd seem kinda soft (the approach I mean, not my emotions) in dealing with their disciplinary problems. The thing is, I find it hard to unleash my full emotion (anger in the instance of microteaching) to people other than those I'm close to like my family. For instance, whenever I'm angry, I never ever restrain in showing my angered facial expression and tone of voice to people I'm close to. However, I can amazingly show a great deal of restrain and patience in dealing with other people. This is probably because I'm more comfortable at being myself with the former. Also, I usually find it hard to get affected emotionally or react very much to something like anger when it is induced by someone I'm not really close to. Weird reasonings to explain my behavior, I know. Yet, these could probably be the reasons why there are double standards in the way I deal with people. Anyway, the reason why I mentioned this is because I find that it affects the way I deal with my students. As they are people whom I'm not close to, I find that I too show a great deal of restrain whenever I handle any discipline problems related to them. In a sense, this could be good as I'm indirectly displaying patience. However, patience is not always good. Sometimes, students need to see that you're really angry with them otherwise, they may not take you seriously. If you show too much patience, they may think that you have a high tolerance for discipline problems or worse, have a lackadaisical attitude towards it. As a corollary, they make be inclined to commit more discipline problems as they feel that they won't get into trouble for it. In the end, we as teachers will have a hard time in conducting a proper lesson as students may be up to mischief as and when they please. Hmm... at the moment, I still am clueless as to how I can resolve this. About the only thing that I can come up with is to try my best to remember not to show too much restrain when the situation requires of it. Be firm when I need to. Show my anger and disapproval when I need to as well. I remembered viewing the class with lenses full of suspicion before I began my microteaching. In my mind, I couldn't help thinking "What the heck do these people have up their sleeves?" Well, I didn't have to anticipate long as 5 minutes into my lesson, I began to see hints of the possible (mis)behaviour that the students had installed for me. The first signs of problem surfaced when I noticed Latifah, Weili and Lishuang gesturing and talking excitedly amongst themselves. It actually took me a few seconds before the thought "Uh-oh. Signs of trouble!" registered in my mind. I tried to curb their behaviour and also, signal to them that I was aware of what was happening by enquiring what the hype was about over there. During this short exchange of conversation, my eyes too chanced upon a morose looking Yunbing who kept her gaze lowered and seemed to be tinkering with something in her hands. Something clicked in me then that there was something not right about the scene but I chose to push it to the back of my mind and continued on with the lesson. A minute or so after I continued the lesson, I was interrupted yet again by Latifah, Weili and Lishuang. While addressing their interruption this time, my eyes also chanced upon Yunbing slashing her wrists with a penknife. Again, I had wanted to ignore this problem. However, I found that I couldn't do so this time. The situation just looked too pressing for me to ignore. Further, judging from Syikin's and Yingchian's (they were seated at Yunbing's sides) body language and facial expression, it looked like they wanted me to address it. However, I was clueless as to how I could tackle the problem. Plus, I was in the midst of a lesson. After a quick mental run through of my lesson plan, I decided that I would talk to Yunbing later on when I've assigned the class the group activity to work on. However, within a minute or two, Yingchian started to urgently call out to me that Yunbing was cutting herself. The former also expressed her fear of seeing Yunbing cut herself. Thereafter, Syikin too expressed her fear at seeing Yunbing cut herself. I went over to Yunbing and asked her to give me the penknife. She ignored me and continued slashing her wrists. 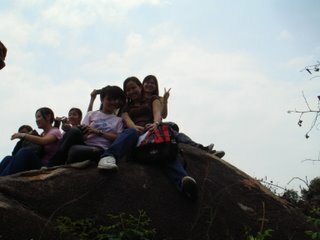 Yingchian commented how dangerous it was. I asked Yunbing for the penknife for the second time. Again, I was ignored. By this time, almost everyone had stood up and crowded around Yunbing and me. Some had even started to cry as they were afraid of being confronted by a self mutilation scene in their own classroom. My only thought then was to get the penknife out of Yunbing's hands. Seeing that my pleas had failed, I asked Yingchian to persuade her to hand over the penknife. It failed. In fact, Yingchian was cut by the penknife. I then proceeded to wrestle the penknife out of Yunbing's grip. I knew that it was dangerous to do so but I did it anyway. A tussle followed. She firmly held on to the knife while I struggled to get it out of her grip. Finally, she relented and surrendered the knife to me. Before I go on, I'd just like to say this. Despite all that had happened, I was still aware that everything was simulated. For example, even when I handled Yunbing's problem, I was aware that I was pretending to be a teacher and she was pretending to self mutilate herself. Suffice to say, I wasn't entirely into my teacher role for the entire first half before the counselling scene. However, something happened between the time that I counselled her and came back to class that made me forget that I was in a simulation. When I re-entered the classroom, it was as that of a teacher. As a teacher, I was definitely irritated when I saw that someone had messed around with the powerpoint WITHOUT MY PERMISSION. The irritation increased when I saw that the class refused to cooperate by telling me where Kaixing was when I asked them. My irritation level was also pushed further up when Syikin dilly-dallied in following through with my instructions to ask Melissa, Yingchian and Kaixing (I'd assumed he was there initially) to get out of their hiding place. Finally, it gave way to anger when they refused to come out of their hiding place. In the end, I couldn't help but shout for the three of them to come out. My attempts to continue with the lesson were again disrupted. This time, it was disrupted by a discussion about AIDS. Apparently, the class had this wild idea that Melissa and Yingchian were up to some hanky panky when they were hiding and could've gotten AIDS. Also, some were worried that Yunbing's self-mutilation could have resulted in AIDS as well. Grrrr... HONESTLY! Where's the logic here people?!? Seeing that it would be pointless for me to continue talking about photographs when the students seemed so preoccupied with the notion of AIDS, I decided to embark on a short AIDS talk with them and clear whatever misconstrued thoughts they had about this illness. Actually, another reason why I did so was because I felt that it served as a good distraction from the 'trauma' (self mutilation; classmates' disappearance) they exerienced earlier on before I continued on with the lesson. I think that it was in the midst of this talk that Kaixing sauntered in. I enquired where he had been. All he did was gave me a nonchalant expression and said somewhere something along the lines of having a coffee break outside. I was definitely peeved at that response however, I also felt immense relief at seeing him back in class. His presence meant that all my students were finally back with me in the classroom and somehow, knowing that gave me a reassuring feeling. Anyway, I was already utterly drained by then and just didn't want to handle the discipline problem(s) presented by Kaixing (and Melissa and Yingchian!). I just noted down the time when he wasn't present in my class and attempted to continue with my lesson. I didn't get far. Therefore, I was extremely glad when Kenneth stopped the lesson a few minutes later. It had literally felt as though the bell just rang. D-day for my microteaching has finally arrived. I'll be covering the topic on "Reading and Interpreting Photographs". I was initially scheduled to be covering the topic on Plate Tectonics. However, upon further pondering, I decided to change the topic that I was supposed to teach. The reason why I decided to switch topics at the last minute (literally last minute!) was largely due to the fact that I really wanted to try my hand at teaching this topic. During my ESE, I was given the exact same topic to cover for one of my geography lessons. However, I remembered that I bluffed my way through as I taught this topic. I had come to class armed with only the pictures and questions in the textbook to be covered. I was supposed to teach another topic for that particular lesson but there were some last minute re-shuffle on the day itself and as a result, I had to teach (unprepared) photograph interpretation instead. I remembered walking away from the class feeling utterly guilty and disatisfied with myself. I also felt that I was being unfair to them. They'd come to class trusting (i hope!) that they were in good hands but instead, had walked away unaware (i do hope they were unaware!) that their teacher had just bluffed her way through. As such, I am taking the opportunity given to me during this microteaching session to adequately prepare myself for this topic. During my preparation, I was brought to awareness of the various knowledge involved in teaching photograph interpretation. The importance of organizing the photographs into decipherable sections before reading and interpreting them and thereafter, drawing geographical conclusions based on the picture as well as our prior knowledge in geography were some things that were raised to my consciousness. I'm not saying that I have no knowledge of these prior to preparing for the lesson. I do. It's just that having done photograph interpretation for years, the steps involved in doing this has become ingrained in my mind. I can perform these tasks automatically without being aware that I was indeed going through the steps. Sometimes, I even skip the part where I had to section the photograph into three (foreground, middle ground, background) and zoom immediately into the pertinent details of the photograph and start drawing my geographical conclusions. In preparing for the lesson however, I was forced to slow down and bring myself to my students' level. I had to constantly stop and ask myself whether I would know what I was talking about if I were the student listening to me. Other than that, I also encountered problems in finding photographs which I could use for free. Most of the photographs I found on the Internet were bounded by copyright laws. It did get frustrating after some time to keep encountering this stumbling block and I did consider just taking the photographs regardless of the copyright issue. However, I decided against it after I found a cool site which allowed users to use its photographs for free. Okay, that said, I'm looking forward to my microteaching session later on. I was initially appehensive and quite worried of it. I'd even wished that I had signed up for the microteaching sessions under Mr Yee instead of Kenneth as then, the focus would just be on teaching approaches and not classroom management! However, after being part of a few microteaching sessions, I realized that these sessions would be useful to me afterall. I do need the practice in classroom management that this microteaching session could give me. Based on my ESE, I realized that I might have a problem in this area. I tend to be slow to react to problems in the classroom and worst, am too relaxed in my reaction to them. I really do not know why I don't feel any sense of urgency whenever i encounter any problems in the classroom (actually, this extends to other aspects of my life as well) but the fact that I'm too calm when I experience them worries me. So, I will try to summon a sense of urgency and not remain to calm during my microteaching session later on. Er, that's such a weird thing to be concerned over as a teacher but yes, I am concerned over being too calm when thrown supposedly-to-make-one-panic situations. I've just included a new link to the side bar. Clicking on it will take you to an online file sharing site which I had just set up. After searching high and low for a suitable site to host my files, I've finally found one which has met my requirements thus far: free, user friendly and relatively sufficient storage space. While 1GB can be considered to be small by today's standard, I think that it's a start for now. My purpose for creating this public sharing folder is to upload Geography related sources for other fellow student-teachers to download and use for their lessons in future. At the moment, I only have one file there: Geography Field Package on Gentrification. It's frivolous of me to upload this file there since it has not even been graded. However, I feel that having resources such as these (regardless of whether it has lots of flaws or not) can potentially be useful. Based on my past experience, having a readily available resource is useful in a sense that they provide us with possible ideas that we can adopt. What's needed is just a little tweaking on our part in order for it to suit our needs.